Dr Jengo's World: E3 2018: Hopes, Expectations & Predictions! Once again, it's that time of the year..
All the big news, reveals and information from our favourite games will be right here! Like many of you, I have my hopes, expectations and predictions for this year's E3 2018..
Well, this is definitely in development. How far in, that's the question.. It's been a few long years since the last Borderlands game released and it's probably time to release a new one. I really think that we are going to see this finally this year.. However, Randy Pitchford has already came out and said that Borderlands 3 is not going to be at E3, in detail in fact.. but then again, this wouldn't be the first time we have been out-rightly lied to.. I pretty much thought this series is dead until I had this random thought.. With all these Battle Royale games becoming so popular, why not relaunch Twisted Metal as a Battle Royale game? Imagine getting into this crazy vehicles, grabbing weapons and fighting dozens of others on a huge battlefield..
Come to think of it, isn't that what Twisted Metal is all about.. albeit the previous games were in a much smaller scale. With improvements in technology, this could actually work now in a much larger scale.. I would be surprised if no one at Sony has even contemplated this.. I didn't really enjoy the Twisted Metal game that released on PS3 but I think with the lessons learnt from that, this could actually work if they give it a try. A 'leak' revealed that Hitman 2 will be announced soon. This might probably be real, considering there were plans to have a Season 2 of the Hitman game. I loved the episodic format that they went with and I hope they continue with that. NetherRealm Studios is known for 2 things.. The Mortal Kombat and Injustice fighting games. And if you see their release dates..
Time for a reveal then? More than just a game, I would like to see Mortal Kombat comics. Instead of seeing one MK game every few years, I would like to see the series be 'more alive' in other media. There are plenty of interesting characters and so many stories that can be told. Whether it's a long-running series or several mini-series, I would really like to see MK comics exploring the lore of Mortal Kombat. What exactly is Rocksteady Studios working on? After their Batman Arkham games, they have gone pretty quiet. If rumours are to be believed, they are working on a Superman game. There were also rumours that they were working on a TMNT game.. However, the number of times this Superman rumour has resurfaced makes this either a persistent hoax or probably based on some truth. I personally would have liked it to be a TMNT game but that is a long shot..
We have only seen a teaser so far..
Mixed feelings about this.. I thought Ubisoft said they were going to stop the annual release of Assassin's Creed games. So how come we are getting a new game already? Either way, looking forward to this, although with a little concern.. I'm hoping this actually continues the Bayek & Aya saga, instead of introducing yet another new Assassin(s). There's no surprise that Ezio remains the most popular Assassin because of the trilogy dedicated to him. Likewise, hoping to see more games dedicated to a particular Assassin where we can build a connection to these characters. One of my Day 1 purchases for this year. Looking forward to see how this turns out and how it's going to affect Marvel Entertainment's foray into gaming. 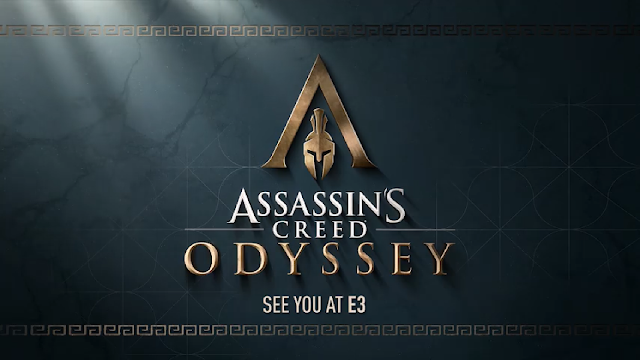 With the game releasing in September, this is already confirmed to be in E3 in a big way. Marvel Gaming Universe??! Please tell me more! Hoping for some info from Square Enix's Press Conference..
Only a Cinematic trailer released so far, but I can confidently say this will be good. An open-world game set in feudal Japan, Ghost of Tsushima is another Playstation exclusive that will be at E3 2018. Personally, the first game was one of the best ever games. So many questions about the sequel, looking forward to seeing more of this at E3. I'm so weirdly intrigued by Death Stranding.. Doesn't really look like my kind of game but yet I'm looking forward to seeing more bizzare stuff from Mr. Kojima. In the months leading up to E3, we have seen character trailers of the 4 playable characters. Time to see some actual game-play footage! Also hoping for a release date announcement, though I'm secretly hoping it will be early 2019. 2018 seems to be rather packed already! From the studio that brought us Assassin's Creed IV: Black Flag, Ubisoft Singapore is looking to expand on their critically-renowned naval combat gameplay with a full-fledged pirate game. It's going to have Naval Combat, customization, looting and all that amazing stuff in a setting that's going to be as beautiful as most of Ubisoft games have given us. I actually did some play-testing on this a couple of years back when it was still in the very early stages. Very excited to see how this is going to turn out and looking forward to see how or what they implemented from our feedback during the focus group sessions. Haven't played any of the reboot games yet but this will be something I'll be following. The Last of Us meets Sons of Anarchy.. Even considering the list of Playstation Exclusives at E3, this is my most anticipated one of them all. Still too early to say if it will match up to my expectations but from what I have seen so far, it looks pretty good. Days Gone will be releasing on Feb 2019, so hoping to see lots of new info. The big question.. Is 'Shadows Die Twice' actually Bloodborne 2 or is it a different IP altogether? There's a lot of clues that point towards it being the sequel but it could be argued otherwise as well. Considering the first Bloodborne comic mini-series ended with a reveal that there will be a 2nd mini-series, I'm willing to bet that we will see Bloodborne 2 being announced at E3. Yet another potential epic from Rockstar Games, I'm not going to let micro-transactions and pre-order bonuses damp my excitement for this. Say what you want about post-release content, online stuff and what not.. the Single-player Story mode itself will be enough to be a GOTY contender. While Rockstar Games don't usually turn up at E3 but I'm expecting at least a trailer shown in Sony's Press Conference. Another rumoured game that we have been hearing a lot of noise about, I'm predicting we will see this announced. An old favourite of mine, back on the PS2. Other games have taken my time and attention since then, but I would still be celebrating if this announcement does happen..
Well. apart from the ending of God of War, nothing's been said about a sequel.. but why the hell not?! I don't want to be waiting another several years for the next Kratos' adventure so announce it already! Nah, I'm just kidding.. Way too early for that now.. but seriously, the sooner the better! A series close to my heart.. I'm going to put this down every bloody year till they actually release it! That's it guys! Can't think of anything else for now. Tell me what you guys think.. Anything else you guys want to see? Do you think my predictions will come true? Are you in the same boat as me, secretly wishing for a Twisted Metal Battle Royale game? Tell me in the comments below!